Before enlisting in the service, William Fox lived with and labored as a farm hand for the Asa Munn family in Marilla, Erie County, New York. 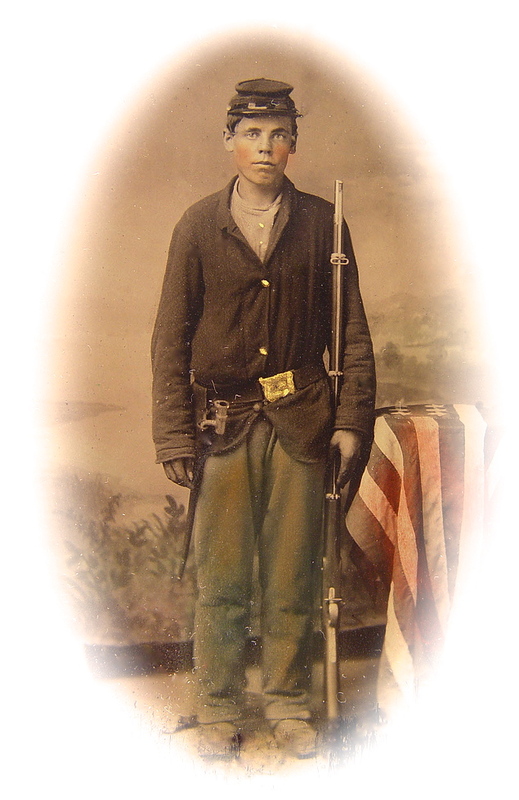 On 21 October 1861, he enlisted at Buffalo in Company C, 21st New York Infantry for a term of two years. William mustered out of the service at the end of his two years; nothing further found. In the 1860 Census, William’s sister Mary was enumerated in the household of Benzion F. Dean in Alden, Erie County, New York where she boarded and worked as a domestic servant for the family. Benzion Dean (1828-18xx) was a farmer. I received a letter from you last Friday stating that you hadn’t received a letter from me in two weeks. I was sorry to receive such an answer. Mary, I have written to you every week & sometimes twice a week. At all times I will fulfill my promise. I have written to Maggie twice. The next day after the boys come in from picket I wrote you a letter. I received the letter that you sent from Frank & Munroe. I have sent Frank’s letter back to you the next day after I got it. Mary, yesterday I went over to the 49th [New York] & Reuben Heacock ² said that he wanted to send home & have his mother send him a ___ quilt & some other things. I don’t know what he is agoing to write to his mother. She will come & see you, I suppose. The boots that you sent were too small. I will send a measure & then I think Jake will make them large enough this time. If you have them make another pair, give him this measure & he will know how to make them. You spoke about socks. I have got three pair of good worsted [wool]. You know I brought a pair with me & one pair you sent me. I bought me a pair of woolen mittens at Washington when I first came so I have got two pair of woolen ones & them gloves you gave me. I don’t have much chance to wear them for we don’t have cold weather here. Two weeks ago today we had a little snow for the first time [but] have had none since the sunshines warm. At eleven o’clock we had preaching up in our fort. I wished you could see the big cannons there is in it. Mary, you needn’t worry about me. I shouldn’t wonder if I never see a battle while I am here. I have enough to eat — such as it is. Benzeno ³ has got three blankets & I have got 2. We cover them over on us & I tell you we sleep warm enough. [We] have straw to lay on. You can’t imagine what comfort I take here. If you send the boots & want to send anything else, you may send some butter. Don’t send much for it will cost a good deal. If you send it by express, you will have to weigh what you send & if Miss Sherbeck sends more than you do, she will have to pay more than you do. I will send one dollar in money. When Rose pays me, I will lend you more. James wants something you can send with mine if you send. If you don’t send the boots, write & I will go to Washington & buy me a pair. Boots here are worth from 5 to 7 dollars — poor things at that. I will close this and get ready for ___rate. I will write again in a few days & tell you how I get along. ¹ Upton’s Hill straddles the border between Arlington County and Fairfax County, Virginia. Upton’s Hill takes its name from Charles H. Upton, a newspaper editor from Ohio who settled in the vicinity in 1836. 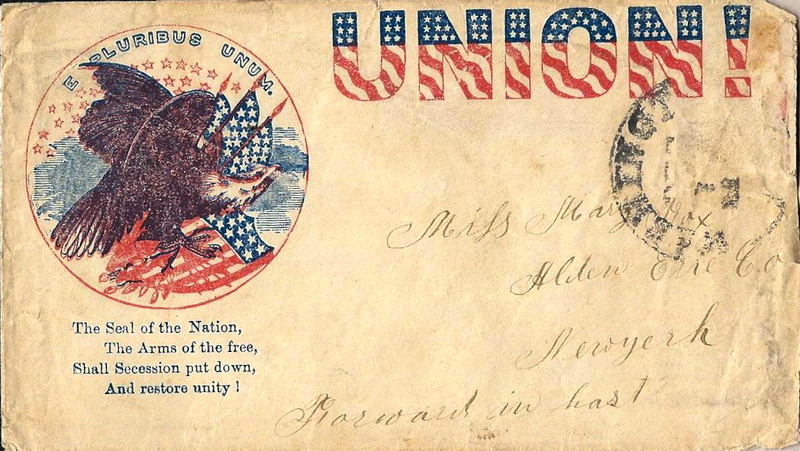 Upton continued his newspaper activities from his home in Virginia for over three decades. By the time the Civil War opened in 1861, Upton had built a fine home atop the hill, on the northeast corner of today’s Wilson Boulevard and McKinley Street. The home was surrounded by fruit orchards and was a working estate. 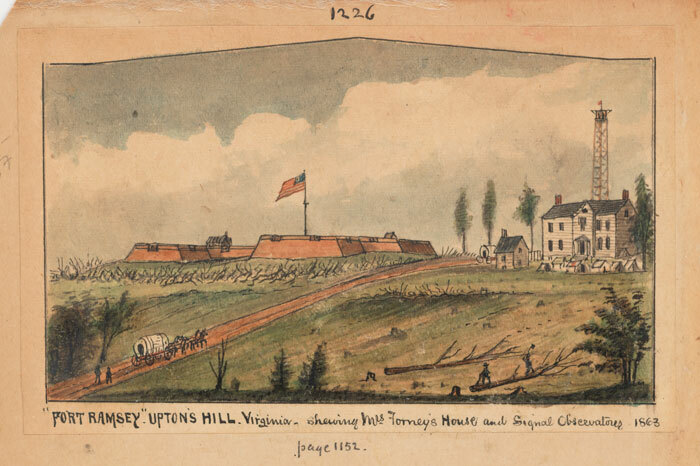 Immediately after the Battle of Bull Run, confederate forces occupied the hill but by September 1861 they had withdrawn to the vicinity go Manassas. Union troops soon occupied the hill and the home at its summit was turned into army headquarters and occupied by Gen. Wadsworth. A masonry fort named Fort Upton (later renamed Fort Ramsay) was built nearby and it was surrounded by several large Union army encampments-—Camp Bliss, Camp Dupont, Camp Graham, Camp Keyes, Camp Marion, Camp Niagara, and Camp Upton. Tradition has it that Julia Ward Howe was inspired to write the Battle Hymn of the Republic after visiting the hill in November 1861 where the witnessed the panoramic view of the soldier’s campfires. At the far left, earthworks “Buffalo” can be seen at the southwest base of Upton’s Hill. Washington D. C. is at far right across the Potomac River. ² Reuben Bostwick Heacock, Jr. (1819-1864) was born in Buffalo, studied law, and was a partner in the firm Heacock & Trowbridge Hydraulics before the war. He mustered in as Captain of Company E, 49th New York Infantry on 28 August 1861 to serve three years. He was killed in action on 18 May 1864 at Spotsylvania, Virginia. ³ This is either Charles Benzeno who enlisted at age 42 or his son, Joseph Benzeno, who enlisted in the same company at age 19. Charles was killed on 30 August 1862 at 2nd Bull Run.